Cricket flour or synthetic meat – which would you chose? Food prices have increased astronomically, beef and lamb costs have grown due to costing externalities, fish stocks are depleted and we still need protein – would you chose cricket flour or the synthetic meat? This scenario is likely only 10-15 years away so it’s worth considering your answer now. I wrote a post last week “The end of cheap food – is cricket flour the answer?” and it quickly jumped to be one of my most google searched posts. There has to be something in the fact that people are googling cricket flour. 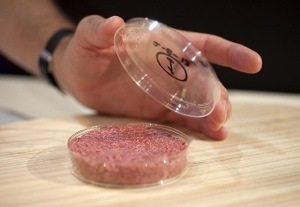 Anyway, I read this on The Guardian yesterday “Scientist to eat lab-grown beefburger“. Yep, we have now ‘progressed’ so far that a scientist has ‘grown’ a beefburger from stem cell protein and is / has cooked it up and eaten it. Doesn’t sound that appetising or even good for the environment. I don’t eat beef and lamb because of the huge environmental impact but I eat pork, chicken and fish to get my protein and flavour – tried being a vegetarian a few years ago and found it a bit bland but that was probably my cooking. In the future my choice of chicken, pork and fish may be as expensive as beef or lamb, or may be so scarce that its a ‘special occasion’ food. So where would I turn to get my protein that we all need to eat to stay healthy? Would I chose the synthetic meat option or would I chose the cricket flour option? At this stage I would have to say that I would go for the cricket flour option. The thought of eating something ‘grown’ in a lab makes me dry reach more than eating a nice tasty cricket. So the thought of using cricket flour in cooking to get my protein is an easy option – you could use it in sweet cooking, savoury cooking or even make some vege burgers with protein. Vege burger made with cricket flour or synthetic meat burger? Which would you chose?